Plus, U.S. and South Korea delay OPCON transfer, PLAN adds a mine countermeasure vessel, and life in North Korea. Weekend links. According to an IHS Jane’s 360 report, Malaysia has started to take down the foundations of a lighthouse it was building in disputed waters. 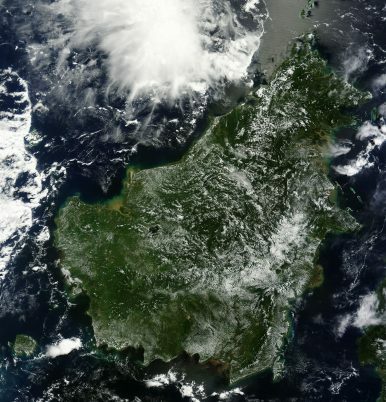 The area, off the Kalimantan coast, is claimed by Malaysia and Indonesia. As Jane’s explains. “Tensions between Indonesia and Malaysia emerged in May 2014 after Malaysia attempted to construct the lighthouse near Tanjung Datu, West Kalimantan, in waters claimed by both countries. Indonesia said that the Royal Malaysian Navy (RMN) dispatched a warship to accompany the civilian vessels involved in the construction work.” Malaysia stopped work on the lighthouse on May 22 after a formal protest from Jakarta. The move will likely help improve bilateral relations between Malaysia and Indonesia. As expected, the United States and South Korea decided to postpone the transfer of wartime operational control (OPCON) of allied forces on the Korean peninsula to “the middle of 2020.” As The Diplomat has discussed previously, a host of problems suggested that OPCON transfer would be delayed yet again. Notably, South Korea’s Korea Air and Missile Defense (KAMD) system and Kill Chain pre-emptive strike systems remain under development — OPCON transfer without these systems being operational was always a long-shot. The United States and South Korea have been meeting to discuss the OPCON issue at a high level every month since June. Despite the United States’ eagerness to see South Korea take on OPCON responsibilities, the issue will be shelved for at least six years. The People’s Liberation Army Navy (PLAN) has commissioned a new Type 81A mine countermeasure vessel (MCMV), according to IHS Jane’s 360. According to the report, the “vessel, named Yucheng and given the hull number 846, is the North Sea Fleet’s second Type 081A and will be based in Dalian in Liaoning Province.” The ship’s role in the PLAN will be to protect Chinese fishery fleets and to engage in coastal patrols. Also, as a bonus, NPR has a great interview up with American journalist Suki Kim who managed to get a job teaching English in North Korea. In the interview, she discusses the taboos of discussing North Korea’s leadership, the outside world, and on what her students — relatively affluent and privileged young North Koreans — would ask her. The topics Kim touches on in the interview are discussed in more detail in her book, Without You, There Is No Us.